September 2018: The sand art sisters duo, Ms. Gowri and Ms. Neelambika have come out with yet another interesting mythological concept, Vamanavatharam for this brahmotsavams. 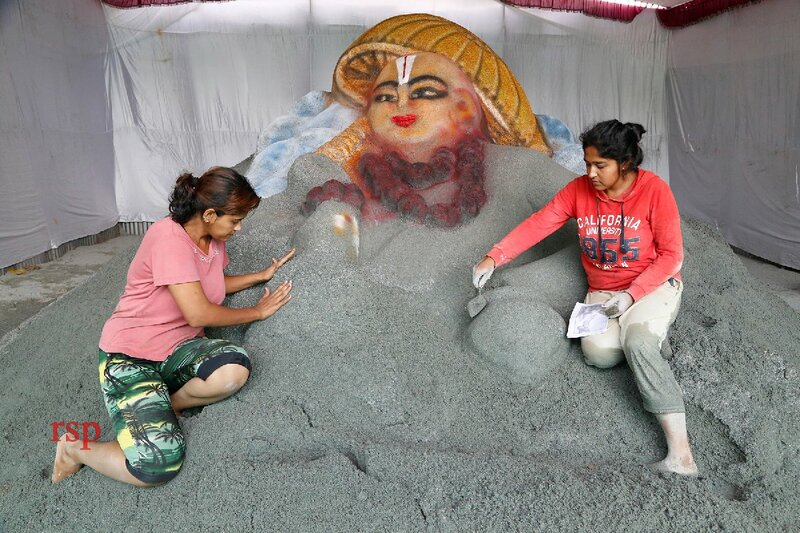 One being an engineer and another a journalism student, these girls from Mysore started doing sand art themes for special occasions since 2011 as they developed immense passion towards sand art and underwent professional training too. So far the sisters did "Saikatha" art in around 40 places across the country. Some of the noteworthy works includes Devi Chamundeswari during Mysore Dasara festival, Mahabharata at Lalbagh in Bengaluru, Eco Friendly Ganesha at Belgaum, Marine sand art in Coimbattore, Tiruchy etc. 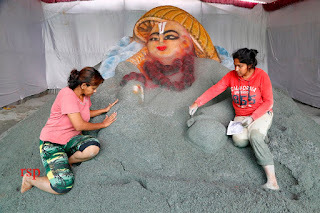 In Tirumala, so far they have attracted millions of devotees with their sand art sculpts during brahmotsavams with Garuda, Mahalakshmi, Varaha Swamy, Matsyavatara, Ksheeradhara themes. Now in Vamanavathara with lord as little Vamana and Balichakravarthi, the sand art depicted one of the most important avatarams, the Trivikrama Swaroopam.